It looks like an omelette but is often called a pancake or crepe. 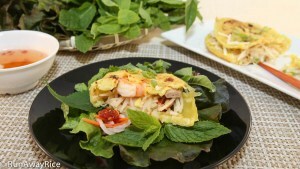 “Banh” means cake and “Xeo” means sizzle–that’s the sound the batter makes when it’s poured into the hot skillet. So “Sizzle Cake” is translated here to Sizzling Savory Crepes. 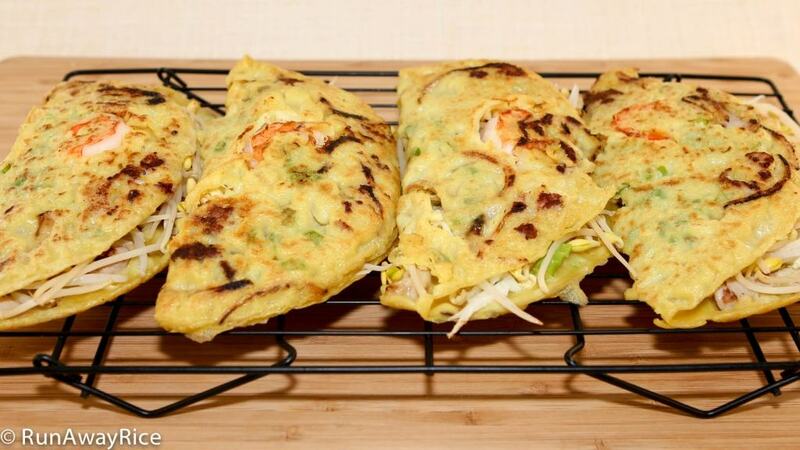 Whatever you call it, these savory cakes made from a rice flour batter, filled with meat, shrimp and vegetables and then pan-fried until crispy, are simply scrumptious. Believe it or not there are no eggs in this recipe. The bright yellow color is actually from turmeric powder, a wonderfully fragrant spice. These crepes can be enjoyed as an appetizer or main dish. Some things you must not omit when serving these delicious crepes are lots of fresh greens, lettuce and assorted herbs, Carrot and Radish Pickles and Fish Sauce Dipping Sauce. Eat these crepes like lettuce wraps. Cut a piece of the crepe and wrap it in chilled lettuce. Add some fresh herbs and zesty pickles. Then dip the lettuce wrap in lots of fish sauce dipping sauce. So tasty and refreshing! The batter needs to rest a minimum of 3 hours to allow the flour to settle to the bottom so you can pour off the liquid from the top. This process “washes” the flour and makes for a nice and light batter. You can buy the batter in ready-to-mix packages at the Asian grocery store if you don’t want to mix your own batter. Just follow the instructions on the package for adding the liquid. For lower calorie crepes, substitute milk for the coconut milk. So folks even use beer as the liquid of choice. Give it a try! It adds an interesting flavor. The traditional recipe uses pork but I like chicken in this dish. Feel free to use any meat you enjoy. These crepes are best made using a heavy 9-inch skillet. A weighty skillet holds the heat well and allows the crepes to cook evenly and quickly. Stir the batter each time before pouring into the skillet as the mixture settles. Don’t use too much batter. The crepes should be thin and not thick like a pancake. Pour just enough batter to cover the skillet. As stove settings and temperatures vary, adjust the heat accordingly after making your first crepe. This recipe does require you to adjust the heat constantly so diligence is required. If you’re not serving the crepes right away, place them on a wire rack and keep them warm in the oven set at 200 degrees F. Don’t place them on a flat surface or they will get soggy. Store any leftovers in the refrigerator. To reheat, bake them in the oven for a few minutes to get them toasty and warm again. Combine the rice flour, all-purpose flour and water in a large bowl. Stir until the mixture is smooth and free of lumps. Let the mixture rest for 3 hours. Rinse the mung bean with water several times until the water is clear. Fill the bowl with water and let the beans soak for 1 hour. Drain into a colander and shake off any remaining water. Add the beans into the rice cooker along with salt and water. Spread the beans out making an even layer and then add water (just enough to cover the beans.) Cook the beans in the rice cooker. When the cooker switches to the Keep Warm setting, unplug the rice cooker and allow to cook for another 10 minutes. Gently scoop out the beans into a small bowl and set aside for now. Peel the onion and then cut into thin slices. Use a vegetable peeler to remove the skin from the jicama. Cut it into thin strips or use the fine blade on a mandoline to shred. Cut off the root end of the green onions and discard. Chop the remaining stems and set aside in a separate cup. Cut the chicken into thin strips. Combine the chicken with minced garlic, salt and black pepper. Set aside for now. Carefully pour out the liquid from the top of the flour mixture removing 1 cup and discard. Add the sugar, turmeric powder, and coconut milk and then mix well. Stir in the chopped green onions. Heat a skillet over Medium heat until it’s hot. Brush the skillet with 1 tsp of vegetable oil. Add 1 oz onions and 2 oz chicken and stir-fry for 3 minutes. Add 3 pieces of shrimp to the pan. Stir the batter quickly to dissolve any settling. Pour a ladleful of batter, a little less than 1/2 cup, into the skillet. Quickly swirl the skillet and distribute the batter into a thin and even layer. Sprinkle 1 Tbsp of mung beans, add 1 oz of jicama and 1 oz of bean sprouts onto the crepe. Cover the skillet with a lid and cook for 2 minutes (until the shrimp is pink). Remove the lid and turn up the heat to Medium High. Cook for another 2 minutes. Check under the crepe and make sure it’s golden brown. Use a spatula to fold the crepe in half and then cook for another minute. Transfer the crepe to a wire cooling rack. Continue making the crepes until all the ingredients are used. Is the plain flour essential? I’d like to keep the batter gluten-free. What would be an option, please? For a gluten-free option, replace the all-purpose flour with corn starch. Enjoy! I used your banh xeo recipe and it came out so good. My youngest already asked for a repeat performance. Instead of water or beer i used club soda and forgo the 3 hrs resting period. The crust came out crispy without the aid of a lot of oil. Another keeper from your recipe file!! I tried many recipes before but the crepe all tends to be soft. I like the crunchy one w/o adding too much oil. how it goes. Thanks for sharing. Your videos/instructions is one of the best out there. Definitely I’ll support the beautiful work via amazon and spread the word.